This query takes 2 minutes and 13 seconds to complete. Whereas a single operation (operation 19) takes 2 minutes and 8 seconds before feeding back its parent operation 17. At least I know where to focus my attention. But Why? Why this full table scan? Just before having this execution plan I have asked to re-gather statistics on tables and columns without histogram. Statistics seems to be Okay. And, by the way, it is normal that a full table scan is chosen by the CBO to generate 5,5 millions rows. Isn’t it? As far as the most time consuming operation (table T5 full access) is in the EXISTS part I commented it and run the query which, unsurprisingly, came up instantaneously with about thousand of rows (1469). All in all the commented part when uncommented would normally keep from those 1469 rows only rows that fulfill the EXISTS clause and throw away the remaining rows. We need then to manipulate at least 1469 records. So why this enormous 5,5 millions rows? 9 - access("OOST". "START_DATE">=TO_DATE(' 2013-11-20 00:00:00', 'syyyy-mm-dd hh24:mi:ss') AND "OOST". "START_DATE"
Joining first using the T5 primary key index and filtering in a second step. The Bloom filter and the Oracle internal view (VW_SQ_1) in the first plan disappeared from the new one. You know what the no_unnest hint does and the effect of push_pred hint has got on the query. According to this execution plan there are only 379 rows to be merged. But the client was complaining about the 12 seconds this merge statement is taking and asked for improvement. Well, it is quite clear from the supplied information that the CBO is wrongly hash joining 5,637,000 worth of rows from the probed table t1 (operation 8) with 372 rows from the built table t2 (operation 5 and predicate 6), burning a lot of CPU at operation 4 and finally throwing away the majority of the 5,637,000 rows from table t1 that are not fulfilling the join condition (predicate 6). This is the MERGE statement? I got the optimal plan. The plan I want the CBO to use without any hint. You can easily point out from the above two execution plans that the cost of the NESTED LOOP (1116) is greater than the cost of the HASH JOIN (1107) and this is the main reason why the CBO is prefering the sub-optimal HASH JOIN plan. A HASH JOIN being unable to perform an index lookups on the probed table t1 using the join condition col_sk, the CBO traumatized the merge statement by using a costly full table scan. Finally, solving my problem resides on understanding why the cost of the NESTED LOOP(NL) is greater than the cost of the HASH JOIN. It is the density of the join column (col_sk). Which collects stats for all columns without collecting histogram. In the optimal plan we start by taking the 357 (or 379) rows to be merged from the outer table using predicate 6 and then we scan the inner table using this 357 join columns via an index range scan. The majority of the rows are eliminated much earlier. In the sub-optimal plan it is the last operation, the HASH JOIN OUTER that eliminates the majority of the rows. Which means in this case : we started big and finally finished small. But to have a performant query we need to start small and try to keep small. Bottom line: when you meet a sub-optimal execution plan using a HASH JOIN driven by a costly full table scan on the probed table while you know that the probed table could be very quickly transformed to an inner table of a NESTED LOOP join scanned via a precise index access on the join column, then verify the statistics on the join column because this one plays an important role in the cost of the NESTED LOOP join. I like very much Tanel Poder snapper and Carlos Sierra SQLTXPLAIN . They represent valuable performance diagnostic tools. Unfortunately I am still waiting to find a customer site where I will be allowed or granted necessary privileges to install and to use them. There are client sites where I have been asked to tune queries without having the possibility to execute dbms_xplan.display_cursor. Let alone installing SQLTXPLAIN under SYS user or having grant select on x$ tables. This is why I have installed them in my personal laptop and I am using them very often in my personal Oracle Research & Developments (R&D). Although, personal work are peanuts when compared with onsite oracle consultancy work, I didn’t renounce to ”home” use them. My second step in deepening my SQLTXPLAIN R&D was to buy Stelios Charalambides book Oracle SQL Tuning with Oracle SQLTXPLAIN. In the meantime Oracle 12c has been released and naturally I have installed this release after having uninstalled the last one. I am still reviewing this book. Last week I finished reviewing Chapter 8 and thought that it is time now to devote few time on this tool again because it makes no sense to review this book without having at least the main html report produced by SQLTXTRACT module of the SQLT tool. So I decided to start installing it on my personal Oracle 12c database. SQLT users must be granted SQLT_USER_ROLE before using this tool. SQCREATE completed. Installation completed successfully. And what if I apply SQLTXTRACT to my above simple sql query? SQLDX files have been created. 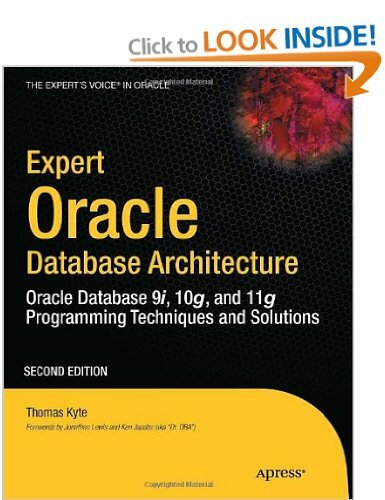 In the process of reviewing books I have bought almost a decade ago (first edition), today is the turn of Tom Kyte Expert Oracle Database Architecture. The review of this book, and a couple of others that will follow I hope in a near future, will not be a classical review in which I will explain what I learnt in Chapter 1 and what I’ve most appreciated in Chapter 4 and so on. However, what I prefer to emphasize is what this book procured me in my daily Oracle consultancy work. It is like if I was shooting in the dark before reading this book and the light came up after I have started investigating the content of this book. I remember a performance meeting crisis where I have been invited as one of the Oracle suffering application developers. The application was inadequately range partitioned by a partition key that was never invoked in the client business queries in which there were practically no partition elimination. All partitioned tables have been given a composite primary key (id, partition key) policed via a unique locally partitioned index. Few days before the crisis meeting, I was religiously reading Chapter 13 about Partitioning in which, among other interesting things, Tom Kyte explained the relationship between Local Indexes and Unique Constraints which should absolutely include the partition key in their definition to be allowed to exist. Oracle enforces uniqueness only within an index partition—never across partitions. To trouble shoot this performance issue, the newly recruited DB -Architect suggested with authority to (a) transform all global (or b-tree) indexes into locally partitioned ones and (b) to get rid of the partition key from the primary local index. I am against advises that say ”transform all”. In Oracle there are always ”It depends” situations that make the ”change all” advice very often if not always a bad one. But the Tom Kyte words about local Indexes and unique constraints were still ringing in my ears so that I couldn’t resist the temptation to stop by and say to the architect ”You need to review your partitioning skills before suggesting such an impossible unique index change”. I would have never said that if I haven’t been in touch with this book. This book gave me the necessary self-confidence I was lacking to develop performant scalable and available Oracle applications. It gave me a good picture of how Oracle works. I learnt via the content of this book how to model and test a situation before jumping to a hurried conclusion. I need no effort to persuade you to have this book with you. Just go to ask tom web site and see the enormous work the author has done and you will realize how intelligent you could be by buying this book. But why the Instance Activity Stats part of the same report is showing 193 user commits per second? From where this discrepancy is coming from? However, if I commit inside the loop (you shouldn’t commit across fetch by the way, this is not a recommended PL/SQL habit) the figures start their deviation. And here where the discrepancy starts. I have an extra 10 user commits while my log file sync wait event underwent a single wait increment. This is a PL/SQL feature which seems to increment the log file sync per PL/SQL block call and not per user commit call. That is 100% correct. I am trying to participate in several Oracle forums including OTN, French Oracle forum and Oracle-list. If I can’t bring my help I try to understand the Original Poster (OP) question and analyze answers brought by other participants. Proceeding as such, I learnt many things. Among them what I learnt today via this otn thread. Does this particular table contain 1,048,575 partitions? Of course it doesn’t. Thanks again for Jonathan Lewis who showed this information in the above mentioned otn thread. 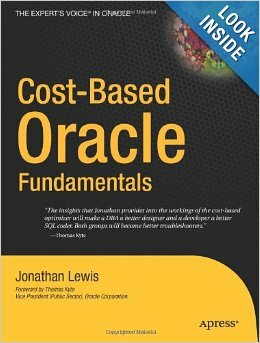 It was back in late 2005 or early 2006 when I was prompted by an Oracle magazine issue to buy the then best Oracle seller book of the year: Oracle Cost Based Fundamentals. When Amazon shipped me this book, I was really disappointed when I started browsing its content. The first question that came to my mind was: is this book speaking about an Oracle technology? You can imagine how much this question revealed my degree of Oracle ignorance by that time. To my defense I was working for a customer as a PL/SQL developer under Oracle 8i. My tasks were to faithfully transform business requirements into a technical requirements and then into a set of stored procedures. Oracle 8i was under Rule Based model while the book I bought explains fundamentals of Oracle Cost Based Optimizer. I was in such a situation that inevitably the content of this new book was not matching my interests. So I put it on hold. Several years after, I started a new job where trouble shooting performance issues was a crucial part. The application was upgraded from 8i (Rule Based) to 10gR2 (Cost Based) and was suffering terrible performance problems. It was time for me to wake up both the book and my head from their hibernation. Degustation of the book content begins. More than 4 years after I have started trouble shooting performance problems and particularly bad query execution time, I am still using and savoring the content of this unrivalled and unequalled book. There are 14 chapters in this book; I am not going to tell you what chapter is must to read or what has most retained my attention. This is not a book to only read and re-read. This is a book to learn by heart. This is a book you should always have with you when trouble shooting queries bad execution time. This is a Swiss knife allowing a CBO dissection. Simply put, this book is so that if, when speaking with an experienced Oracle tuning DBA-Developer, I came to realize that he still has not read this book then I immediately measure the gap he has to fill before he will start doing correctly his job (unless he has read the Performance Guide itself :-)). Index design I : Partitioned Index: Global or local? Recently I was investigating a performance problem using the SQL Monitoring feature looking for SQLs taking more than 5 seconds, when one query retained my attention. I drilled down to its corresponding SQL Monitoring Report and started looking carefully to its execution plan. There was a particular index range scan operation which retained my attention because it was consuming a huge amount of logical I/O (buffers). A careful examination of the index and its underlying table reveals that the latter is range partitioned while the former is a local non prefixed index (a locally partitioned index which doesn’t include the partition key in its definition). My curiosity is so that I issued a query to see how many non prefixed indexes exist in the whole bunch of partitioned tables this application owns. The query of course returned several rows. When I asked the developer about the reason, he said that this is a ”standard” they have adopted because they are, every couple of months, truncating old partitions; and having local indexes (even non prefixed ones) is a good idea in this case because they don’t have to rebuild any global indexes (by the way there is the UPDATE GLOBAL INDEXES clause for that). Spot how many times the INDEX RANGE SCAN operation has been started: 1492 times. Compare this number to the number of table partitions (1493) and you will find that in such a kind of situation you will do N-1 INDEX RANGE SCAN operations (where N is the number of partitions). That is an enormous waste of time and energy. Why 1492 INDEX RANGE SCANs? It is simply because a locally partitioned index contains multiple segments in contrast to a b-tree index which consists of a single segment. Since Oracle has succeeded to eliminate non touched partitions (PARTITION RANGE SINGLE) it has pruned down to a single segment index range scan as shown by the Starts information which equals 1. In addition, the consistent gets (Buffers) has been drastically reduced from 2984 to only 2. You can also point out that in contrast to the locally non prefixed index we did 50% less of logical I/O – from 2984 down to 1496. By the way, why do you think Oracle allows the creation of the non prefixed index LC_NON_PREFIXED_TYP_I when it is declared as non unique and refuse to obey you when you want to create it as a unique index? Simply because Oracle has already measured the impact this kind of index can have on the insert performance if it has allowed it to exist. In this case a mho_typ_id could go in any of the 1493 partitions. How would Oracle proceed to check if the inserted mho_typ_id value has not been already inserted (or is being inserted) without impeaching others to insert into the whole bunch of the 1492 partitions? Is this scalable and performant? Of course it is not.